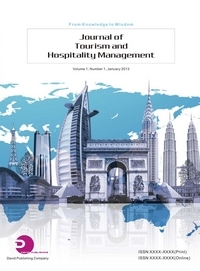 Journal of Tourism and Hospitality Management is the leading international journal in the field of travel and tourism. The journal comprises a multitude of activities which together form one of the world's fastest growing international sectors. The journal takes an interdisciplinary approach and includes planning and policy aspects of international, national and regional tourism as well as specific hospitality management studies. The journal's contents reflect its integrative approach - including primary research articles, discussion of current issues, case studies, reports, book reviews and forthcoming meetings. The journal is published by the American Research Institute for Policy Development that serves as a focal point for academicians, professionals, graduate and undergraduate students, fellows, and associates pursuing research throughout the world. The interested contributors are highly encouraged to submit their manuscripts/papers to the executive editor via e-mail at editor@aripd.org. Please indicate the name of the journal (Journal of Tourism and Hospitality Management) in the cover letter or simply put ‘Journal of Tourism and Hospitality Management’ in the subject box during submission via e-mail. The journal is Abstracted/Indexed in CrossRef, CrossCheck, Cabell's, Ulrich's, Griffith Research Online, Google Scholar, Education.edu, Informatics, Universe Digital Library, Standard Periodical Directory, Gale, Open J-Gate, EBSCO, Journal Seek, DRJI, ProQuest, BASE, InfoBase Index, OCLC, IBSS, Academic Journal Databases, Scientific Index. Each paper published in Journal of Tourism and Hospitality Management is assigned a DOI®number, which appears beneath the author's affiliation in the published paper. JTHM is inviting papers for Vol. 4, No. 1. The online publication date is June 30, 2016. Submission Deadline: March 31, 2016. N. B. To unsubscribe, forward this email to info@aripd.org with 'Unsubscribe' in the subject line.